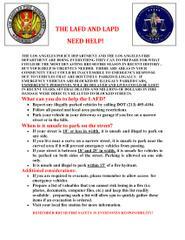 THE LOS ANGELES POLICE DEPARTMENT AND THE LOS ANGELES FIRE DEPARTMENT ARE DOING EVERYTHING THEY CAN TO PREPARE FOR WHAT COULD BE THE MOST DEVASTING BRUSH FIRE SEASON IN RECENT HISTORY , BUT YOUR HELP IS URGENTLY NEEDED. THERE ARE AREAS IN YOUR COMMUNITY THAT COULD BE INACCESSIBLE TO EMERGENCY RESPONSE DUE TO VEHICLES THAT ARE ROUTINELY PARKED ILLEGALLY. IF EMERGENCY VEHICLES ARE BLOCKED BY ILLEGALY PARKED CARS, EMMERGENCY PERSONNEL WILL BE DELAYED AND LIVES COULD BE LOST! IN RECENT YEARS, SEVERAL DEATHS AND MILLIONS OF DOLLARS IN FIRE DAMAGE WERE DIRECTLY REALTED TO BLOCKED STREETS.